Dave..sorry. Save your pennies, a red will turn up sooner than later, be ready to pounce when the right one comes along. You'll know it. Be-yooty. Much more than enough for a street machine. Mileage? Have you explored the dealer price of a full service (valves and belts) yet? Had one of these 20-yrs ago. Great bike with awesome feel. Then CBR600RR came out and that was it. It's 1999 748, had it for 5-years. Best bike I ever had up to that point. More crisp than VF500F. Then CBR600RR came out with 50-lbs lighter wet-weight and 25% more power. Made Duc feel kinda... agricultural in comparison. Kinda like driving regular 911 in comparison to an F-40. Nothing wrong with Porsche, it does everything competently. Just doesn't have extreme screaming adrenaline-rush that Ferrari has. Did back-to-back at Laguna Seca with friend's CBR600RR and I was sold; 5-sec/lap is significant. In fact, all my fastest times at all tracks have been on my CBR600RR. Tried getting back on Italian bike last year with Aprilia's RSV4 demo-day @ Thunderhill. Nope, didn't like it one bit. Even though it went 60mph faster on straights than Ninja 250, it just didn't have crisp scalpel feel of Ducatis. Too many electronics changing things around behind scenes and it felt like I was controlling bike with rubbery puppet-strings. Twist throttle and there'd be fraction-second time-delay, with non-linear response. Same with brakes, awesome initial deceleration splattering tear-drops onto face-shield, but additional-squeeze resulted in nothing (ABS says, "no-no-no, you don't want to go there"). Made it difficult to trail-brake into corners. All these electronic aids for our own good, makes bikes not as enjoyable. Feels like you're being taken for ride on back-seat, rather than riding and controlling bike itself. Definitely learn to do it yourself, not that difficult. I had shop do it 1st time around for me, ouch! Then I figured out how to do it myself next time. Duc forum owners report the new Multistrada major service in the $1800 range! totally eliminating "chasing" needed shims. Also converted to MBP collets on the older '95, eliminates the half ring retainers, which consistently get pounded...thus changing clearances. MBP collets tend to stabilize the valvetrain, *greatly* increasing mileage between actual shim changes. A set of MBP awaits installation on my newer SS800 during the future 6000 mile valve check. Hey, I'm clearly showing my age here, but I'm convinced more than ever the older air cooled, Desmodue boomers are " 'da bomb". 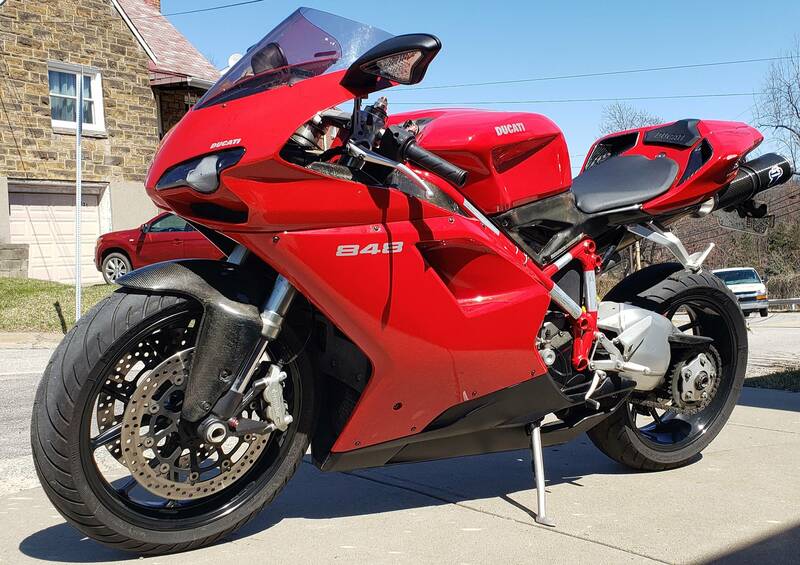 Last futzed with by ducatiman; April 18th, 2019 at 09:07 AM. Yep!!! For exact same reasons, air-cooled Porsches have appreciated in value dramatically in recent years. Many of them are more valuable now than they were when new (even when adjusted to today’s dollar). On Ducati forum, I'm reading guys are snatching up mid 90's Supersports left and right, from west to east coast. For those few members who are choosing to sell theirs...they don't last long on the market at all, a few days the norm. Can't explain why the increased demand of late, other than what I've already posted on the SS good points. There is clearly a common, long term attraction to this particular series of machine. Safe to say they have reached "late model classic" desirable status. Understandable, i guess. The light weight is what appeals to me most on the SS series followed closely by the style then the simplicity of the entire bike eslecially that 2valve motor. The 900 will get smoked in a straight line by any of the 600cc super sports but they carve corners like they are on rails and the bottomless always available torque those motors pump out makes them ideal foe the street. I have 2 water cooled ducs already and I have been trying to decide between a 250 2 stroke or a 900SS as my next bike. Really tough decision as I have wanted both for years. The Duc is the better choice but the appeal of something as rare as a NSR, TZR or RGV is nearly irresistable. The Duc would be half the price and half the maintainance but a 300 lb 50hp 2 stoke....well I dont need to say any more on that. I have seen people get their 900SS down to 370-360 lbs with lots of work and money so the potential is there. Still a tough decision for me. I am still jealous of your SS and the VFR also as that would be #4 in my stable if I could convince my wife to allow any more bikes. Honday reliability in a beautiful, great handeling chassis plus the smooth power of the V4 and the wonderful sound they make opened up! As I'm a street rider, even moreso as I'm ageing...outright top speed, power are meaningless considerations to ongoing ownership. If so, I'd have transitioned to any number of big bore 4 banger HonZuKawi options. No thanky. Fully respect your considerations of ultra rare, collectible, lightweight smokers. Your comments on "THE" V4 right on the mark. Its the late 90's, pre-cat, gear driven cam, FI model....if only Honda could have trimmed the weight down. Honda came real close...but again, a nod to Ducati on the "total package". Ducati gets key for the twisty, sporty stuff. But when longer highway drones are called for...the VFR lights up. They perfectly compliment one another. Thank you for comments on my choices, you are *right there* as well with mature, well thought out, potent examples in your group. Please DO post up when further additions/changes occur!